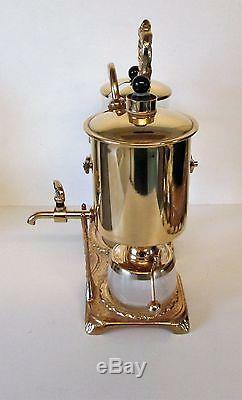 CLASSICONA PURVEYORS OF FINE SIPHON COFFEE MAKERS PLUS ACCESSORIES & VINTAGE CONA SPARES. FOR A WIDE RANGE OF FINE SIPHON COFFEE /TEA MAKERS NOW! 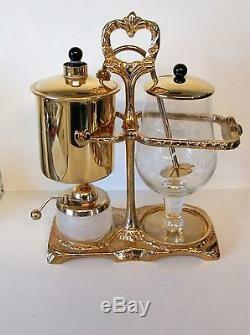 PERCO RETRO BALANCE COFFEE/TEA MAKER. GOLD PLATE WITH A REALLY HEAVY BASE GREAT SOLID STRUCTURE. VERY LIGHTLY USED PROBABLY 2-3 TIMES ONLY. PERCO RETRO BELGIUM DELUXE MODEL. FIRST MADE IN THE 1950`S. ALL IN GREAT VINTAGE CONDITION. THE PARCELS MAY NOT ARRIVE AT THE SAME TIME.... BUT THIS IS THE MOST COST EFFECTIVE WAY TO SEND IT! 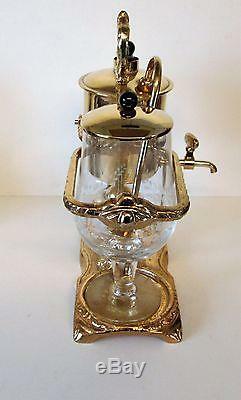 MACHINE COMPLETE WHICH HAS THE DELUXE CRYSTAL CUT CARAFE GLASS WITH A LOVELY ETCHING ON IT! ONLY 1 GLASS CARAFE INCLUDED (ON MACHINE). PICTURE OF SEPARATE GLASS FOR YOU TO SEE ITS BEAUTY. 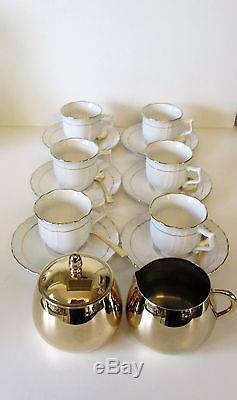 WITH 6 DEMITASSE CUPS & SAUCERS made by S chirnding Bavaria (Made in Germany) unused. ORIGINALLY SUPPLIED AS AN EXTRA BY PERCO BELGIUM. 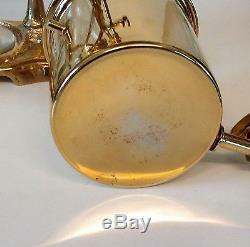 1 CREAMER JUG IN GOLD PLATE AND 1 SUGAR BOWL IN GOLD PLATE. THIS IS MY ULTIMATE FAVOURITE SUCH SPLENDOUR AND REFINEMENT... ITS ALWAYS DIFFICULT FOR ME TO SELL THESE AS THEY ARE SO BEAUTIFUL I ALWAYS WANT TO KEEP THEM! THIS IS SO BEAUTIFUL I WOULD LOVE TO KEEP IT... BUT HAVING 2 WOULD BE GREEDY! PERFECT ENOUGH FOR MY COLLECTION. IT WILL BE WELL PACKED. BEAUTIFUL CONDITION SEE DESCRIPTION BOX ABOVE. WE CAN OFFER A DIRECT BANK TRANSFER FROM YOUR BANK TO OURS NOW... ALL CUSTOMERS ARE ENTITLED TO THIS FREE OPTION ON THESE ITEMS ONLY. IT IS A DIFFERENT MODEL BUT WILL LET YOU SEE THIS STYLE WORKING! HURRY AT THIS PRICE THIS WILL GO FAST!! CREDIT/DEBIT CARDS BY TELEPHONE INTERNATIONAL & UK. PLUS NOW YOU CAN REQUEST AN INVOICE SECURELY PAYABLE BY CARD FROM US! SEE OUR TERMS & CONDITIONS IN STORE. OFFICE HOURS 09.00 HRS - 21.00 HRS GMT. Boiling water is pushed through the metal pipet. By the time the water reaches the grounds, it has cooled a few degrees. The result: Coffee and water meet at the perfect temperature to extract the oils and flavors, but not so hot as to impart "scorched" taste. The beauty of this process is that the coffee is brewed by extended contact with water at exactly the right brewing temperature, the temperature is maintained throughout the process, and then the coffee is immediately separated from the grounds. The system traps the delicate aroma and flavors in the closed canister to produce a coffee unlike any you've ever tasted. The bitter grounds stay in the glass carafe by way of a gold filter at the end of the overflow pipe. There are no paper filters to impart a slightly papery taste, or even worse, to take up the aromatic oils that give the different coffees their unique taste. The coffee from a syphon can best be described as "crystal clear", with great purity of flavor and aroma and no bitterness added by the brewing process. Any faults in the coffee flavor will also show up, so syphon users tend to gravitate to the best beans they can find. No other brewer can give the same purity of flavor and lack of bitterness due to the exquisite temperature control, since the coffee brews about 2 degrees celsius below boiling point, without ever actually boiling. Conclusion As of today, no coffee maker equals the balancing syphon in brewing the purest coffee. One of the most stylish, inspiring and exclusive ways to make coffee is with a balancing syphon. The "alchemical" display of kettle, pipes and counterweight, are guaranteed, just as it did for frans jozef and elisabeth, to impress friends and relatives, while also making a darn good if not perfect cup of coffee. Balancing syphon systems appeal most to those who value academic novelty and ceremony as much as the corporeal pleasures of taste and smell. With a balancing syphon at the table, your success is guaranteed. The item "PERCO RETRO VINTAGE BALANCE COFFEE MAKER 0.6 LITRE COMP SET VGC GOLD PLATE" is in sale since Monday, October 15, 2018. This item is in the category "Home, Furniture & DIY\Appliances\Coffee, Tea & Espresso Makers\Percolators & Moka Pots". The seller is "classicona" and is located in Guildford.